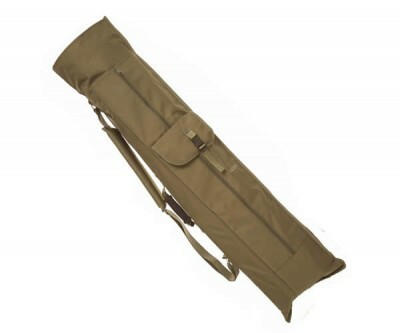 This substantial quiver is capable of holding up to five rods plus a slimline bivvy such as the Trakker Crossfire. It has a padded retainer strap to the rear, five stitched Neoprene rod bands, two zipped front pockets and a large main quiver pocket. A padded adjustable shoulder strap with a metal buckle and neoprene carry handle make it easy to transport. There is additional Nyplex strengthening located at the base.